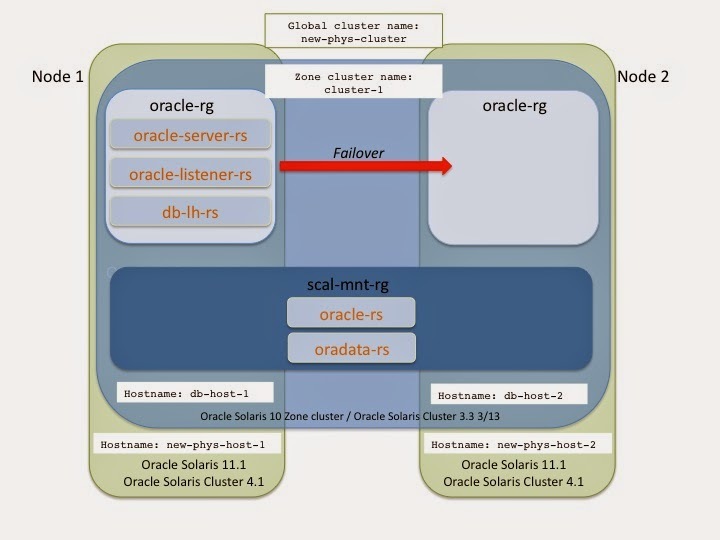 This article describes how to migrate a single instance of Oracle Database running on Oracle Solaris 10 with Oracle Solaris Cluster 3.3 into a clustered Oracle Solaris 11 environment without requiring any modification to the database, by using an Oracle Solaris 10 Zones cluster deployment. Note: The procedure in this article assumes that a two-node target cluster is already set up with the Oracle Solaris Cluster 4.1 software. Figure 1. Source environment: hardware and connectivity. Figure 2 shows a logical view of the source cluster, including the resource groups (rg) and resources (rs) for the HA for Oracle data service, as well as the dependencies between them. Figure 2. Source environment: logical view of resources and resource groups. Figure 3 shows a simplified view of the hardware and connectivity for the target cluster, new-phys-cluster, which is a two-node cluster with two of Oracle's Sun SPARC Enterprise T5120 servers (new-phys-host-1 and new-phys-host-2). Figure 3. Target environment: hardware and connectivity. Figure 4 shows a logical view of the target cluster running Oracle Solaris 11.1 and Oracle Solaris Cluster 4.1 software. 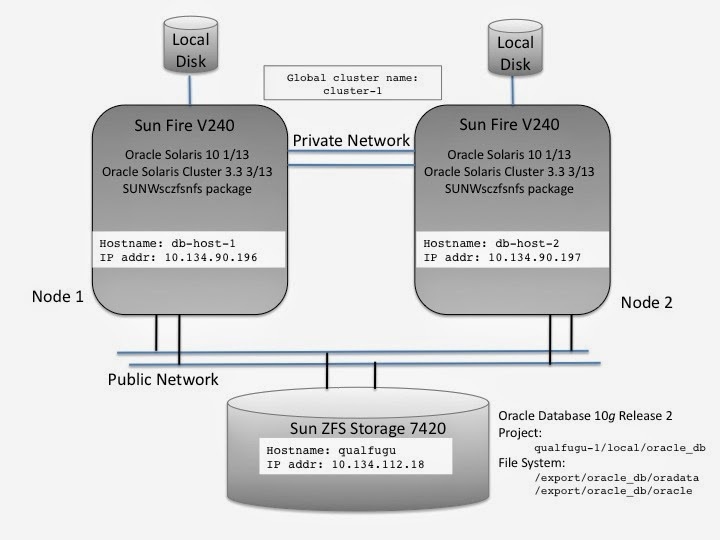 This environment uses the solaris10 brand zone cluster to host the HA for Oracle Database 10g Release 2 configuration that is migrated from the source configuration shown in Figure 1. Figure 4. Target environment: logical view. In the logical view of the source cluster shown in Figure 2, the oracle-rg resource group contains the oracle-server-rs resource for the Oracle server instance; the logical host name resource (db-lh-rs) that manages logical host db-lh, which is used by clients to connect to the Oracle server; and the Oracle listener resource (oracle-listener-rs). The scal-mnt-rg resource group contains the oracle-rs and oradata-rs scalable mount-point resources, which manage mount points /u01/app/oracle and /u02/oradata/, respectively. These components are shown in the following status output. db-lh-rs            db-host-1   Online   Online - LogicalHostname online. 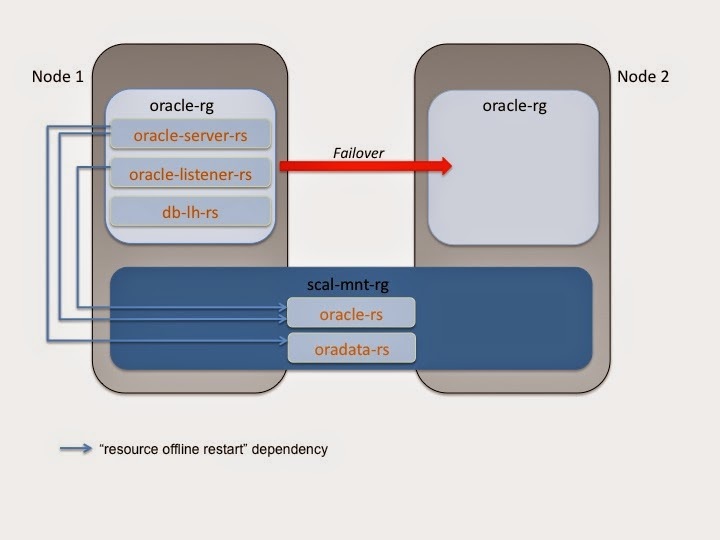 The oracle-listener-rs and oracle-server-rs resources have dependencies of type resource_dependencies_offline_restart on other resources. For more details on the types of dependencies that are available in Oracle Solaris Cluster, see the r_properties(5) man page. The oracle-listener-rs and oracle-server-rs resources have the following extension properties. Oracle Database software is installed on the NFS shares on the Sun ZFS Storage 7420 appliance. The following command shows information about the configuration of the Sun ZFS Storage 7420 appliance. File system /export/oracle_db/oracle, which is mounted on the cluster nodes at mount point /u01/app/oracle, is the installation path for the Oracle Database software. File system /export/oracle_db/oradata, which is mounted on the cluster nodes at mount point /u02/oradata/, is the path for database files. The following are the /etc/vfstab entries for these two files systems on both nodes of the cluster. The public network is using domain name service (DNS), and DNS is running and configured as follows. # Copyright 2006 Sun Microsystems, Inc.  All rights reserved. # Use is subject to license terms. # DNS for hosts lookups, otherwise it does not use any other naming service. # /etc/netconfig file has a "-" for nametoaddr_libs of "inet" transports. # server lookup. See resolv.conf(4). # before searching the hosts databases. #   figure it out pretty quickly, and won't use netgroups at all. The following is the identity of the oracle user. Before you begin the migration, perform the following tasks. Copy the contents of /var/opt/oracle/ to NFS location /net/qualfugu/archive/optbkp/. Unconfigure the Sun ZFS Storage 7420 appliance from the old cluster. (Optional) Delete both resource groups. Note: If this cluster is reinstated, the NAS shares from the Sun ZFS Storage 7420 appliance can be added back by using the clnas add command, and the resource groups can be brought online by using the clresourcegroup online -emM command (if they were not deleted). 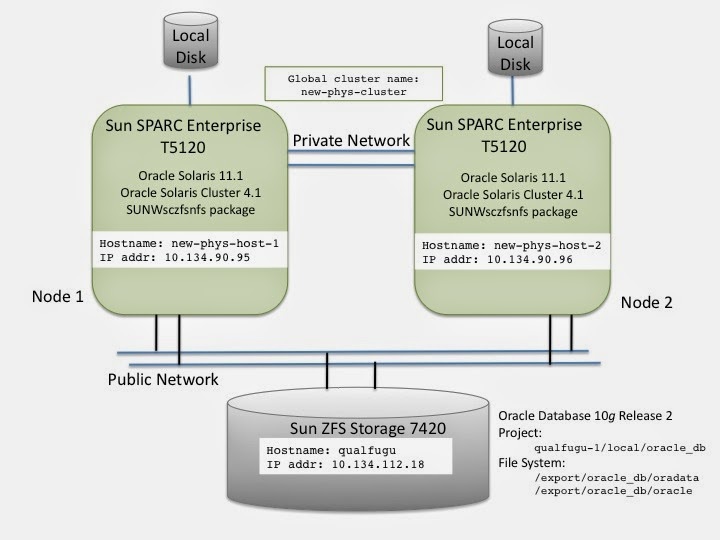 The target two-node cluster new-phys-cluster includes the following (as shown in Figure 3 and Figure 4): two Sun SPARC Enterprise T5120 systems (new-phys-host-1 and new-phys-host-2) running Oracle Solaris 11.1 and Oracle Solaris Cluster 4.1. We will create a new solaris10 brand zone cluster, cluster-1, on the target systems. The zone cluster will host the Oracle Database service that was configured in the source cluster running in an Oracle Solaris 10 environment. Note: The procedure below assumes that the two-node target cluster is already set up with the Oracle Solaris Cluster 4.1 software. Ensure that the cluster nodes are online. Install the solaris10 brand zone's support package on both nodes. On each node, verify the status of the IPMP group for the public network, sc_ipmp0. This interface will be used to configure the node-scope network resource for the zone cluster. This configuration uses the same host names for the cluster nodes and for the logical hosts as were used in the source setup shown in Figure 1. Note: Oracle Solaris Cluster 4.1 software supports only the shared-ip type of solaris10 brand zone cluster. Oracle Solaris Cluster 4.1 SRU 3 supports the exclusive-ip type. Configure the new zone cluster. Verify the zone cluster configuration. Although it is possible to use one of the original Oracle Solaris 10 physical cluster nodes from cluster-1 to create an archive and use it for the zone cluster installation, that option would involve making sure the original cluster meets the patch level requirements to ensure the zone cluster installation is successful. Instead, this document will use a known solaris10 zone archive (by installing the archive from an Oracle VM Template), to ensure the results described in this article can be reproduced by readers on their own systems. This approach includes extra steps for creating a dummy zone, obtaining the archive out of the zone installed from the Oracle VM Template, and deleting the dummy zone that was used to obtain the archive. Download the Oracle VM Template to either of the two Sun SPARC Enterprise T5120 servers in the target cluster. See the Oracle VM Template for Oracle Solaris 10 Zones README (which is embedded in the template) for more details. /net/qualfugu/archive/: A directory on the Sun ZFS Storage 7420 appliance that contains the Oracle VM Template and is also used to store the dummy zone archive. /net/qualfugu/osc-dir: A DVD or DVD image path for the Oracle Solaris Cluster 3.3 3/13 software, which is available here, and the relevant patches, which are available on My Oracle Support. /net/qualfugu/nas/: A directory that contains the NAS client package (SUNWsczfsnfs), which is required to configure the Sun ZFS Storage 7420 appliance for the Oracle Solaris Cluster configuration. Install the dummy zone to obtain the archive, as shown below, where -a 10.134.90.201 is the IP address and /zones/cluster-1 is the root path for the dummy zone. This is an Oracle VM Template for Oracle Solaris Zones. Copyright 2011, Oracle and/or its affiliates. All rights reserved. software,  unless required by law for interoperability, is prohibited. Will create a Solaris 10 branded Zone. Install the zone cluster by using the obtained zone image. Log in to the console of zone cluster-1 on all nodes of the zone cluster. Boot the zone cluster into the offline/running mode. After the zone boots, make sure system configuration was completed. If the system configuration was not completed, complete any pending system configuration. Note: You can skip this step if the archive contains cluster software, for example, if the archive is from an Oracle Solaris 10 physical cluster node or a cluster brand zone on an Oracle Solaris 10 system. Install the Oracle Solaris Cluster 3.3 software from the DVD or the downloaded DVD image from the global zone. -d specifies the location of the cluster software DVD image. -p patchdir specifies the location of the patches to install along with the cluster software. The location must be accessible to all nodes of the cluster. -s specifies which agent packages to install along with core cluster software. In this example, all is specified to install all the agent packages. Reboot the zone cluster to boot the zone into online/running mode. Verify that the zone cluster is now in online/running mode. Configure the Sun ZFS Storage 7420 appliance for the zone cluster that was used in the source cluster setup. On db-host-1, install the required NAS software package in the zones of the zone cluster. Repeat Step 1 on db-host-2. Add the Sun ZFS Storage 7420 appliance to the cluster configuration. Create mount points on both zone cluster nodes and add /etc/vfstab entries. Create the oracle user on both nodes of the zone cluster. Make sure that the identity is the same as that of the source setup. Mount the file systems and verify that the file systems are accessible by the oracle user on both nodes of zone cluster. Create the required file system resource group and resources. Bring online the file system resources. Verify that the file system is mounted properly on both nodes of the zone cluster. Note: Often the database has a specific SRM project (entries in /etc/projects) to be used for the database to obtain the correct level of system resources. For such configurations, these project specifications must be reproduced in the solaris10 brand zone cluster as well. Restore the contents of /var/opt/oracle on all nodes of zone cluster. Create the resource groups and resources required for HA for Oracle. db-lh-rs               db-host-2    Offline    Offline - LogicalHostname offline. db-host-1    Online     Online - LogicalHostname online. Perform failover verification by halting one zone where the resources are online. Verify that the status of the zone cluster on node new-phys-host-1 is offline/installed. Log in to the other node of the zone cluster and verify the status of the resource. Note that the following output is same as that obtained from the source setup shown in Figure 1.
db-lh-rs               db-host-1   Online      Online - LogicalHostname online. db-host-2   Offline     Offline - LogicalHostname offline. Migration to the solaris10 brand zone cluster is now complete. This article described how to migrate an Oracle database running on Oracle Solaris 10 in an Oracle Solaris Cluster environment to Oracle Solaris 11 without upgrading the database software by using Oracle Solaris 10 Zones and Oracle Solaris zone cluster features. This migration is an example that can be extended to other application environments and shows how Oracle Solaris can help preserve infrastructure investments and lower migration costs.